such as recover word , excel , photo , video,pst ,pdf , pictures from partition. Generally, every partition should be formatted before use, and may be reformatted for some reasons during working. When you format a partition, the Operating System erases all bookkeeping information on the disk, tests the partition to make sure all sectors are reliable, marks bad sectors (that is, those that are scratched), and creates internal address tables for later uses to locate information.But sometime when you accidentally reformat the computer system or hard drive/disk or partition,which because of: Operating System not found ;Invalid or corrupt FAT32/exFAT ; Cannot find file or program; Primary/Secondary Hard disk failure;Non system disk;Disk error; etc. Use "Full Scan" mode to recover lost files windows 10 partitions show as "raw" or recover deleted files in windows 10 which can not be found with "undelete" and "unformat" and "recover partition",recover files from raw partition,recover files of partitons which are not NTFS,nor exfat,nor fat32. 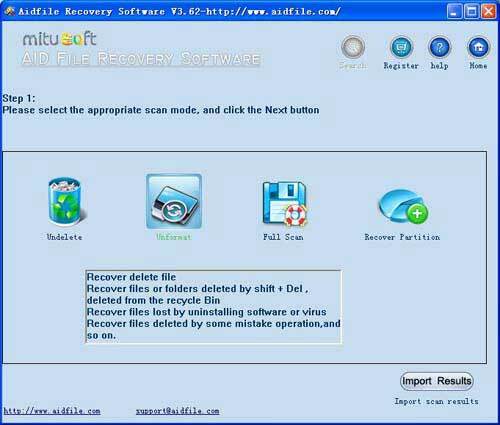 Aidfile recovery software professional edition's "Full Scan" support deep and full scan lost data from formatted partition , hard drive, usb. If the partition accidentally got formatted, do not store any new data to this partition. Otherwise the formatted data will be overwritten. Be aware of that some down loaders may save downloaded files into this partition by default. Generally speaking, it is more likely (almost 100%) to recover NTFS partition, while you can only recover most of the files if it is FAT32 partition. The possibility to recover tens or hundreds megabyte files will be much lower than to recover the small files, such as pictures, tables, documents. The recovery opportunity will be greater when the partition has been converted from FAT32 to NTFS and can get a fairly complete directory. When you format your disk but forgot to backup data, how to retrieve data from hard drive partition from a formatting, Aidfile Recovery Software will recover lost data which had been formatted. Aidfile Recovery Software is the most comprehensive formatted hard drive partition recovery software for windows and also the most useful formatted partition recovery software for users to restore formatted files. It can search for formatted drive/disk or partition on any version of Windows including - Windows 2000, 2003, XP, Vista, 2008, Windonw 7. Its Complete Recovery Mode is especially designed for formatted drive/disk partition recovery. It works excellently in format file recovery. If you are troubled or interested in how to recover files from formatted drive/disk or partition, please refer to Tutorial for recovering data after format for more details. Recover files from formatted partition for hard drive is easy for Aidfile Recovery Software . No matter the files on external hard drive partition formatted, Aidfile Recovery Software can get them back if they weren't overwritten by new data. Select the "Recover Partition " or "unformat" or "full scan"